This beauty of a co-sleeper has been making its way through the blogsphere for a while now. The Culla Belly Co-Sleeper, designed by Manuela Busetti and Andrea Garuti of Studio di Progettazione, won first place at the Playing Design's International Design Competition for children's design (phew!) 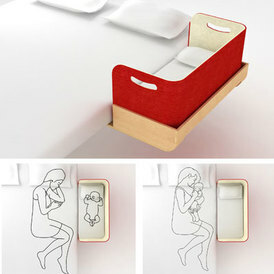 - simply put, it's the best looking/most convenient co-sleeper out there!. 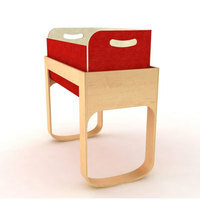 And the team designed these attachments to convert it into a rocking cradle, to boot! Sadly, as far as I hear, there has been no news as to if this product will go into production for a round 2, let alone whether it will be available in the United States.